1.- Se describe la técnica para llevar a cabo le prueba "in vitro" de transformación de linfocitos en linfoblastos, como método diagnóstico de alergia a drogas y en el caso particular a la insulina. 2.- Se Presenta un caso diagnosticado positivamente mediante la prueba mencionada, de alergia a la insulina, en una mujer ignorada diabética, de 40 años de edad. 3.- Se comenta en forma general la utilidad del método diagnóstico de transformación de linfocitos en linfoblastos, altamente sensible y de probada utilidad en la p´ractica médica. 1.-SCHELLEY, W. B: "Indirect basophil degranulation test for allergy to penicillin and other drugs" J. A. M. A. 184:171. 1963. 2.- BAKER, P. J.; BERNSTEINT, M.; PASSANEN. V. and LANDY, M.: "Inmuno-adherence bretonite test”. J. Immunol. 97:767, 1966. 3.- ROBITT, J.R.; SHECHTER, H. and POLLACK, V. E.: A Critical evaluation of the indirecta basophil degranulation test. Proc. Soc. Exper. 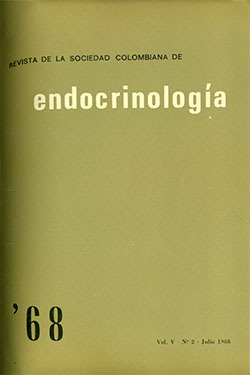 Biol, and Med., 11: 608, 1964. 4.- REDMOND, A. P.; AND LEVICEN, B. B.: The relationship between direct inmediate skin test and passive transfer in man. J. Allergy, 39; 51, Junary. 1967. 5.- SALAZAR MALLEN Y ORTIZ,L. : Descripción de un nuevo método inmunológico para determinar la alergia a la penicilina. Alergia, 7:423. 1960. 6.- KERN, R. A. and WIMBERLEC, N. A. Jr: “Penecillin reactions: the nature, growing importance, recognition, manadgement and prevntion". Am. J. Med. Sci. 226:357. 1953. 7- PAULL, A. M.: "Occurence of the L-E phenomenon in a patient with a severe penicillin reaction". New Eng. J. Med. 252:128. 1955. 8.–HEGGIE. A. D.: “Incidence of circulating antibody to penicillin in penicillin hipersensitivity reactions". New Engl. J. Med. 262: 1160. 1960. 9.— LEVINE, B. B. and OVARY. Z.: "Studies on the mechanism of the formation of the penicillin antigen. III. The N- (d-alfa-bencil-peniciloyl) group as an antigenic determinant responsible for hypersensitivity to penicillin G." J. Exper. Med. 114: 875. 1961. 10. — PARKER, C. W.: “Penicillin allergy”. Am. J. Med. 34:747. 1963. 11.- HALPERN. B.: KY. N. T. and AMACHE. N.: "Diagnosis of drug allergy in vitro with lymphocyte transformation test”. J. Allergy 40:16-181. (sep.) 1967. 12.— HANAUER, L. and BATSON, J.M. : “Anaphylativ shock following insulin injection. Case report and review of the literature". Diabetes 10:105. 1961. 13.—PRAUSNITZ. C.. The Passive Transfer of Allergy. Intern° 1 Arch. Allergy; 8: 115. 1956. 14.-KARUSH, F., and EISEN, H.N. : A theory of delayed hipersensitivity. The main features of the phenomen are explicable in terms of high affinity humoral Antibody, Science, 136: 1032. 1962. 15.-Halpern, B. et all: op. cit. 11:178. 16. -HOLLAND. P. and MAUER. A. L.: Drug-Induced "in vitro" stimulation of peripheral lynphocytes, Lancet, 1: 1368. 1964. 17. -VISCHER, T. L.: Lymphocyte cultures in drug hipersensitivity. Lancet 29: 467. 1966. 18. -HOLLAND, P. et all: op cit.15. 19.- GIARARD, J. P., ROSE, N. R. KUNZ, M. R., KOBARASHI, S. and ARBESMAN, C. E.: “In vitro" lymphocyte Transformation in atipic patients, in duced by antigens. 20.- -HIBSCHHORN, K.: BACH. F.; KOLLODNY, R. L.: FIRSCHEIN, J. L. and HASHEM, N: "Inmune response and mitosis of human peripheral blood lymphocytes in vitro. Science. 152:1182. 1963. 21 - MILER VON JAN.: Measuring Linphocitoc transformation. Lancet 7432: 300, 1966. 22 — AMOS, D.B. et all: Skin danor selection by Leucocyte Typing. Lancet, 7432: 300. 1966. 25_HAAHEM, N.: Blastoied transformation of Lynphocytes, Lanced 11, 7415: 742. 1966. 26 — HUMMELER, K. HARDES. T. N. EL AL. Electron Microscopic observations on Antibody producing Cells in Lymph and blood, J. Exp. Med. 124: 02, Ag. 1, 1966. 27 — HUMMELER, K. HARDES, T. N. ET AL. Electron microscopis observations on antibody producin Cells in Lymph and blood. J. Exp. Med. 124: 02 Ag. 1, 1966. 28 — SALAZAR MALLEN, M. y COL.: Comunicación personal: abril, 1987.